Two weeks ago I was lucky enough to be able to attend this two day conference, held in the delightful surrounds of Senate House – which is just off Russell Square, at the back of the British Museum and very close to Montague Street, for those of you who, like me, like to know such things – and jam packed full of the best kind of Sherlockiana. I can, hand on heart, say that I found something interesting in every session (and there were several sessions where I had trouble choosing which panel to go to) and there really was an abundance of interesting topics and speakers, all of whom were happy to be drawn into conversation during the coffee and lunch breaks. I learnt an awful lot in two days and not all of it was Sherlock related. There were six panel sessions spread over the two days and for each session there were at least three, if not four, options – so I missed more than I actually saw, if that makes any sense! Sherlockiana, the first panel I attended, had presentations from Benoit Guilielmo (The Birth of a Textual Community: Early Sherlockiana 1927-1934), Atesede Makonnen, (Holmes/Watson: Homosexuality and Fandom) and Nathan Murray, (“As Solemnly as a County Cricket Match at Lord’s”: Dorothy L. Sayers and Holmesian Scholarship). 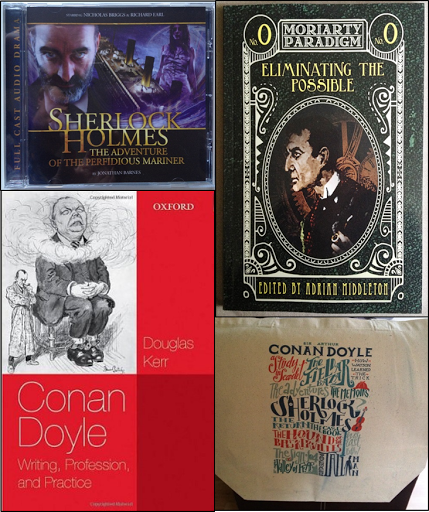 All three looked at very different aspects of the Sherlockian community but they meshed together well – although the appearance of a ‘Red Pants Monday’ illustration in Atesede’s slides may have confused some – and I left with a new appreciation of both Dorothy L Sayers and the probable demographics of the people who might read my fanfiction. Next came Literature, Magazines and the Marketplace, where Tyler Shores (The Persistence of Sherlock Holmes—Copyright, Adaptations, and Fan Culture), Richard Burnip (Holmes and his Contemporaries) and Peggy Lee (Sherlock Holmes and the Victorian Popular Press) proceeded to make my head buzz. It may be the accountant in me who was totally enthralled by the complexities of copyright that Tyler shared but it was definitely my artistic side which was won over by the wonderful set of slides Richard shared; taking us on a journey through the stories that sat alongside ACD’s Holmes on the pages of the Strand magazine. Experiencing Holmes Anew on Friday afternoon could have been made just for me. It was a two person panel involving Robert Ryan (Dr Watson’s War) and Jonathan Barnes (On writing new adventures on audio: into the interstices of canon). Both of these talented men write, Robert having just published “Dead Man’s Land” – the first of a trilogy of books generated by taking Holmes’ comment to Watson in “The Last Bow” that Watson would serve in WWI and running with it – and Jonathan being the wonderful person who scripts my favourite audio plays of new Holmes adventures. It’s always wonderful to get the chance to listen and then talk to people who are actually successful in the endeavours that you yourself are trying to pursue. This was no exception, especially as WWI features quite heavily in my current work. Needless to say I was gripped by every word. Saturday’s first offering was also picked for the writing aspects. Writing Holmes Today: Character, Mash-up and Legacy was a creative panel discussion featuring authors and publishers Adrian Middleton, Mike Chinn, Theresa Derwin, David McIntee and Luke Kuhn who discussed their co-authored paper ‘Holmes and Moriarty: A Steampunk Perspective on Reconnecting Character to Canon’. 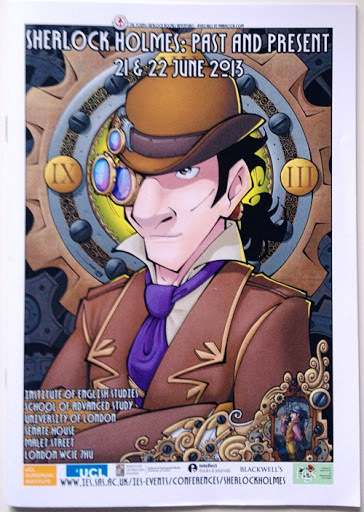 It was a fascinating look at how they are setting up a Steampunk world for the ACD canon and then re-imagining some of the stories within that world. Pastiche, Fanfiction, Roleplay came after the morning coffee break, with Becky Simpson and Lynn Alexander-Briggs (“Mrs Hudson Took My Skull”: Holmes and His Boswell in Cosplay and Roleplay), Philip K. Jones (Doyle and the Illusion of Holmes) and Lauren Rosales (NSFW: A Study in BBC Sherlock Fanfiction). Becky and Lynn, in full Sherlock and John regalia, nearly had me in tears at the end of their presentation when they re-enacted the grave scene at the end of The Reichenbach Fall. Lauren’s look at what makes BBC Sherlock fan fiction ‘classics’ so well loved within the fandom was also fascinating. I don’t think I was the only one to go and share my own ‘cinnamon’ moment with her afterwards. The final panel I attended was Holmes in Action with Sharon Marshall (Watching the Detectives: Ideal Homes Exhibition – The Representation of CineVisual Holmes: Robert Downey Jr, Benedict Cumberbatch, Jeremy Brett), Jon Cranfield (Sherlock Holmes, Sport and Masculinity) and Sarah Weaver (How Smart Is Watson? or, The Role of the Sidekick). It lived up to its promise – Sharon’s presentation included some lovely action shots of Robert Downey Jr’s chest, Sarah made us all think long and hard about just why Watson is often assumed to be stupid (and why that assumption is wrong) and Jon, despite a technical disaster, enthralled us with tales of Eugen Sandlow and ACD’s letters to various newspapers. At the end of the first day we were treated to ‘The Savage Sub-text of The Hound of the Baskervilles’ by David Grylls. This was a look not only at the use of reversion, doubling, atavism and the “unsavoury” sexual subtext in Hound but also at how Hound mirrored other literature of the period in drawing on those things; Dr Jekyll & Mr Hyde, The Picture of Dorian Grey and Heart of Darkness were amongst the contemporary novels that were also discussed. We started with a look at the set up of the story and the pitting of science against the supernatural only to roam through the text. We noted metaphors of hunting, battle and sport, the use of the description of the landscape to ratchet up both tension and the supernatural element, plus the hints Doyle left – hazy and undefined thought they were (and was that deliberate) – about the link between sexual depravity and the “animal within” that the Social Darwinians of the time feared. It was an eye opening way to read Hound and has pointed me to a vast number of things I wish to learn more about. I have already begun to re-read the four books I mention above from this perspective and it is proving most disturbing, in a good way. The final keynote was entitled ‘Holmes into Challenger: The Dark Investigator’ and given by Douglas Kerr. Not only did Douglas look at the similarities and differences between the two characters, but he looked at their origins as well, giving us an insight into how ACD’s career as a doctor would have informed his writing. The similarities between Holmes’ actions and behaviour and that of the medical consultants of the time (and now, actually) are striking and unmistakeable once pointed out; the similarities between Challenger and the scientific ‘celebrities’ at the time (such as Koch and Pasteur) were equally powerfully drawn. Darwin made an appearance here, too, when the ‘imperfect geological narrative’ was mentioned, as did Hound, in relation to the GP/Consultant relationship between Watson and Holmes. The look at ‘When the World Screamed’ and how its darkly satirical plot exposes ACD’s views on the perfidy of the scientific method and the adverse effects science can have on the natural world was extremely powerful, especially in the current scientific climate. The problem of the ethical responsibilities of scientists has not gone away, nor has they been adequately addressed as we rush forward in our need to understand and to discover. The story itself may be over the top but its moral plunges right to the heart of the issue. It certainly gave me pause for thought at any rate. I headed out of the final keynote, and the conference as a whole, with a head full to bursting with ideas and lines of enquiry, plus a notebook with markedly less blank pages than it had on Friday morning. The course dinner on the final evening, at the Sherlock Holmes Hotel on Baker Street (where else could it have possibly been held!) was also brilliant. I should probably apologise to Dr Ben Pore for making him talk shop for quite a lot of the night but I enjoyed myself so much I’m not going to. All in all, Tom Ue and Jon Cranfield put together an excellent two day programme, all of which I thoroughly enjoyed. I do hope that there will be a similar conference next year, possibly to mark the 125thanniversary of ACD being commissioned to write what ended up as The Sign of Four (on 30 August 1889 during a dinner at the Langham Hotel where, incidentally, Oscar Wilde was also commissioned to produce something, the result of which was The Picture of Dorian Grey). I also sincerely hope that the possibility of the papers being collated into a book becomes an actuality as I would relish being able to review the full papers from the panels I attended and to see what I missed at the panels I didn’t. The conference has a facebook page and a twitter account, through which you can find photos of the event, as well as links to other write ups.